No Compromise on Health & Safety at Cement Works. – A cement works, which imports and distributes cement in large quantities, decided to improve the working environment of their bagging plant and warehouse, while at the same time complying with health & safety requirements. 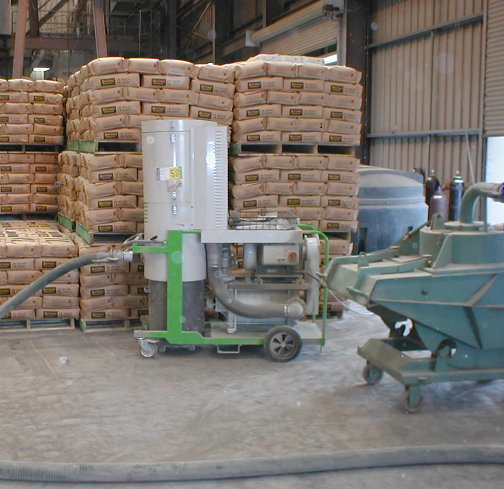 The brief was to provide a heavy duty Industrial vacuum cleaner to collect bulk cement powder. The vacuum cleaner had to be strong, but manoeuvrable for easy transportation around the site. In addition, a strong skip was required for bulk collection. The machine was to be used for collecting the dust from under belts and machines, machine cleaning in the bag packing area and general floor maintenance such as spillages. To meet this brief, BVC supplied a 15kW version of their TI80 ‘Centurion’ vacuum cleaner. With 15kW of power plus an 80-litre bin capacity, the TI80 unit had plenty of suction to do the job. To this was added a 380 litre self-dumping hopper to provide sufficient capacity. A wide variety of hoses and tooling were also supplied, including a ‘Y’ piece, which enables two operators to use the machine at any one time. As a result of installing this equipment, the workers have found a number of benefits. Apart from the cleaner air in the working area (no brush no dust) and less build up of bulk and wastage, the operators have found the equipment very easy to use.